Patterns pressed into the porcelain of the "Lumos" collection, so thin it can be "folded" on itself as seen above, are revealed when lit from within. 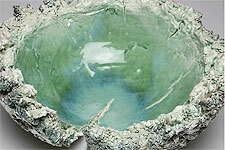 This small "Vulcanoid" bowl contrasts rough-built edges with a colorful, smoothly glazed interior. Editor's Note: Selected items from the "Lumos" collection of porcelain works by German ceramic artist Claudia Biehne are featured in the upstairs gallery at Penelope Wurr Glass & Gifts, 167 Main St., Brattleboro. Stop by to appreciate their organic forms and extraordinarily thin structure—such a wonder! Artist Claudia Biehne moulds both light and heaviness. Those on the search for interesting and idiosyncratic works of art made from porcelain—or even smaller, subtler pieces for everyday use—find them in works by Claudia Biehne. Born in Leipzig, Germany, in 1974, she went to school there. Her training took her to other places. However, since 2004, her home and studio are located once again in the city of her birth. In addition to the workshop and studio work, in the last few years there have been presentations at selected art fairs and museums worldwide. In 2014 alone, her works could be seen at important exhibitions in the USA, UK, Japan, Austria, and the Netherlands, as well as in Germany. Her works can today be found in renowned museums and international private art collections. Such a long and intensive process of examining the material led Biehne to the freedom of working in an experimental way, exploring the limits, and overcoming these, to open up new design possibilities for her porcelain works. The start of this process was marked by her time as a scholarship student in Luxembourg. Her studies at the École des Beaux Arts included the disciplines of painting and drawing [as well as] working in a private potter's workshop, given free rein to explore for herself. When she returned to Leipzig, she started her vocational training as a potter in Angela Teubert's workshop. She then learnt how to master clay as well as the respective glazing and kiln techniques. In 1996, she enrolled in a degree course at Burg Giebichenstein University for Art and Design in Halle, studying ceramics and glass design under Hubert Kittel. At the Burg, she worked in the raw materials of porcelain and glass. Her studies brought her to working with porcelain in many different ways. A semester at the University of Arts and Design in Helsinki, Finland, resulted in a change of focus and seizing the courage to work on her own free and creative development. She has since created several collections in porcelain as well as some individual pieces that are occasionally made out of clay. These are formed into two categories: translucent lightness and deep heaviness. 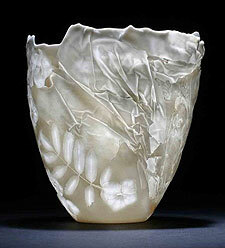 The artist uses the word "Lumos" to describe those objects made from uniquely cast porcelain that she is able to make highly translucent. She tried many things to achieve this. Each failure brought new knowledge that pushed her forward. Today the light and fine bowl objects are embossed with delicate lithophanes (relief designs in the translucent material). Biehne collects and presses flowers and leaves for this purpose. She has since learnt exactly how to handle the individual parts of the plant and when and how she can place them into a casting mould, how she needs to cast them, and how the objects need to be dried so that they can be integrated with the other structures and arranged to set the scene. Her work is in stark contrast to the usual idea of the finished form—unusual moulds, folds as well as creases, and broken frames are all included. That's how dreams are realized out of solid and razor-thin porcelain, which, when light is shone on it, glows in its own very unique and interesting way, allowing the object to carry experiences from nature. This is further advanced in the "Lumos" works, which are true objects of pure light. 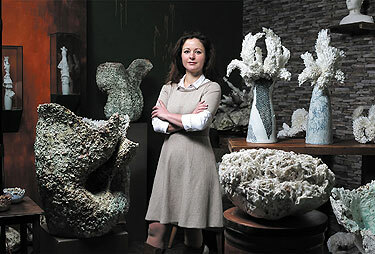 Works in the "Between the Tides" collection are evocative of coral. The artist assembles hundreds of individual porcelain segments together. Multiple burning processes are required, and multiple additions need to be added before a work is completed. The interleaving of perception and design is particularly apparent in her works from "Time and Visibility," for which the artist combines shapes from "dropped" porcelain scraps in her workshop (from over the years) with her own moulds, and has even gilded them partially. These works develop an impressive energy through their forms and structures. The objects in the "Vulcanoid" collection are earthbound in expression and weight. The material appears massive in contrast to the real lightness of "Lumos." While the basic form of each vessel is a bowl, they are more reminiscent of lava, drips of glass, and pieces of rock in between ice and fire. The term "Vulcanoid" refers to hypothetical asteroids within the orbit of the planet Mercury, representing something possible, existent, but not yet certain. Just like the poetical form of Claudia Biehne's porcelain art works. For further exploration, visit online at www.biehne-porzellan.de.